I spent half an hour before work and most of my lunch hour scanning the recent Ask Me Anything interview Chris Whiteside from ArenaNet did for Reddit. There's a quick-read version with just the questions Chris and others from ANet actually answered, which Ravious also links to in his piece about it at Kill Ten Rats, but I think it's worth browsing the whole thread because many of the questions that didn't get answered are more interesting than those that did. It's clear that the whole Ascended fiasco has had repercussions that we'll be feeling and hearing about for a long time to come. Most of the answers are damage-limitation and conciliation around that and the effect is reasonably soothing. The gist seems to be that Ascended gear is not step one of a gear ladder, that there will be ways to get Ascended gear to suit a number of playstyles and that access to these will roll out next year. If we do get another tier it will come in an expansion or a content drop of expansion-like proportions. Wiggle room there, then. Chris also acknowledges more than once that the way Ascended gear was introduced was not done well. I didn't feel, though, that a convincing case was made for why it needed to be done at all, nor was any case made for why it had to be done in such a tearing hurry. Something doesn't add up. Among the few questions on other topics that did get answered, apparently it is confirmed that the recent addition of supposed better loot drops to the loot tables of Veteran and Champion mobs isn't working as intended and is being investigated and that there is still an intention to get something done with Personal Instances (AKA housing). 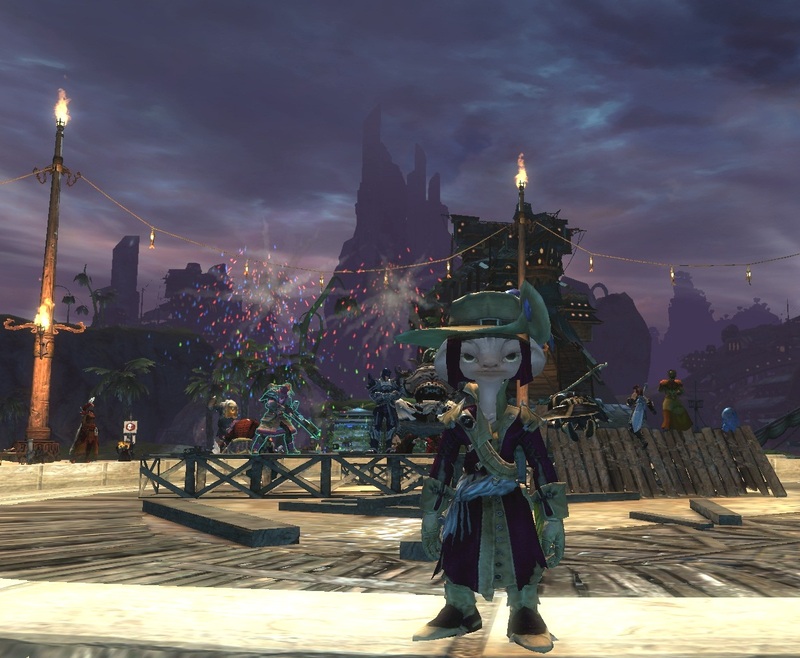 More interesting open-world loot and somewhere to hang my incredibly limited selection of hats (fix that, ANet!) would certainly help to wash away any lingering bad PR taste for me. My conclusion is that ArenaNet's ultra-consistent pre-launch plans did not survive their first encounter with live players. So it's an MMO after all, then. In Blazeridge Steps, just next to the Expanse Waypoint, live a peaceful tribe of Ogres. Peaceful is putting it mildly. Clinically depressed is more like it. These eight-foot-tall musclebound hulks have severe issues with both self-esteem and basic life-skills. They can't train their pets, cook edible food or keep their chickens from running loose. They are routinely bullied by a nearby tribe of bigger ogres, who have clearly benefited from modern counselling techniques (or at least read a self-help book). Their local lake is infested with harpies so that even getting water is beyond them. About all they can do is slump in their cave and hope for a passing adventurer to take pity on them, train their pets, cage their chickens, guard them while they fetch water and finally see off the nasty ogres next-door. That's put the cat among the chickens! If it's a dismal existence for them it's an almost disturbingly emotional experience to play through for me. I've helped them out many times now and I've had plenty of opportunity to study just why their story works so well. The writing itself is solid. Simple, declarative sentences describe their bleak existence with just enough self-knowledge to make it painful. These guys are beaten and they know it. The outside world is too much for them, they've done the best they know how to do and it just wasn't good enough. It never will be. You want to shake them. The event and Heart plotlines are woven together in a very satisfying way. 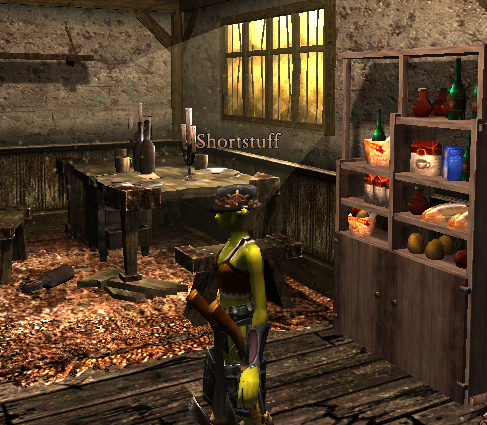 An ogre is only as impressive as his pet and much of the action revolves around this heartwarming theme. The chief is pathetically loyal to the undersized pig he's known since it was "just a little bump". He won't betray him even though Max doesn't do much to impress the girls. The other ogres just want pets that will stay by their sides and make them whole. Any pets would do. And of course everyone needs water, pets and ogres both. Just fill the barrels and run, can't you? So, the dialog is affecting and effective, the story is believable and coherent. What about the voice acting? The first time I went into Degun Shun I thought something must have gone wrong with my ears. There's one ogress who calls instructions loudly to the recalcitrant, untrainable pets. She has the flattest, least-inflected delivery I have ever heard. I couldn't believe it had been authorised for use in a major game release. It was, I thought, almost parodically incompetent. With hindsight, I have come to revise my opinion. It is weird and discomfiting, but this is an alien species, behaving in a way that is alien to that species. At the same time it reflects a deeply depressed, hopeless mental state. As I tried to help the ogres and learned more about their miserable lives, her droning, desolate cadence really began to make sense. Will the harpies come back? The chief, on the other hand, is pathetically hopeful. There is a yearning in his voice as he persuades you to help him, literally and metaphorically, to big up his pig that's both endearing and painful to listen to. The would-be water gatherers, who appear to be what passes for an old married couple in ogre society, have a Beckettian narrative for a life so it's perhaps understandable that they sound like they're auditioning for Godot. All the voice acting is understated, almost thrown away. Coming to it without engagement with the characters, it sounds not just flat but dead. Once you become involved emotionally, though, it begins to press all the buttons. I have yet to succeed in driving off the Ogre bully attack. I don't even like to do that part any more. Seeing the pets I helped my ogre friends acquire and tame stolen by a bunch of thugs, pets that would have been loved and cherished, is too upsetting. As the peaceful ogres sink further into despair I realize that all I've done is made promises I couldn't keep, shown them a better life only so they could see it snatched away. My ranger and engineer at least managed to clear the lake of harpies and get the water back safely. My warrior last night couldn't even do that. The wail of existential despair from the ogress as she and her partner fled my incompetence, condemned to another thirsty day hiding in the cave, was so disturbing I had to go back again this morning and try again. And fail once more. I was actually at the point of logging in my engineer to waypoint over and get them some damn water before I finally came to my senses. 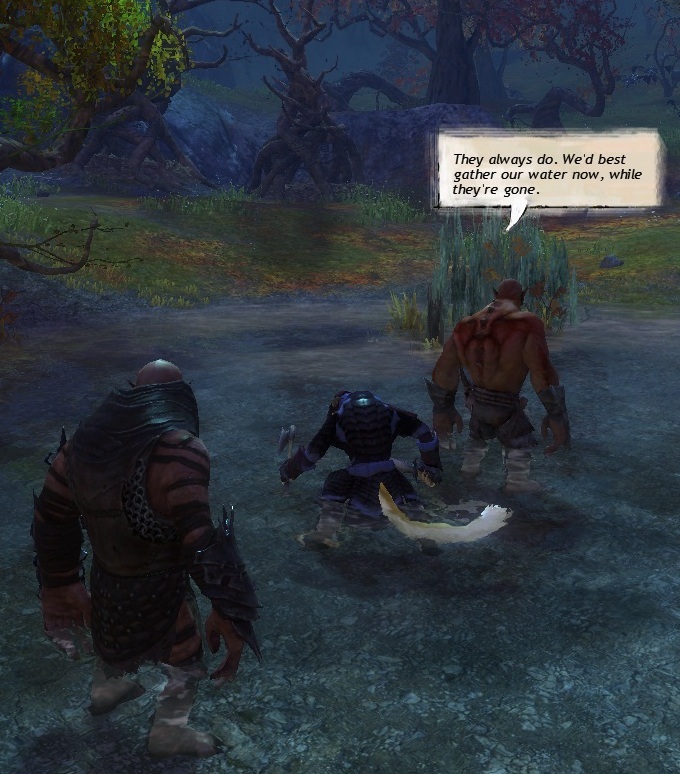 Guild Wars 2 is an odd game in many ways, its approach to narrative foremost among them. Because I failed the water-fetching event and was brooding on a rock above the lake, I got to see something I'd never noticed in my successful runs. After the ogres flee, the thirsty animals, which we had tried and failed to drive off, continue to arrive. More and more of them come down to drink and wallow. For a while all is quiet and then the wretched harpies flock down, screeching and kill them all. The personal storyline, while it has its moments, is a great big, clunking, linear, nose-leading nuisance. The voice-overs that accompany the stick-puppet cut-scenes range from risible to infuriating. Out in the world, though, there is story aplenty, accretive, naturalistic, unemphasized, all around. It's a patchy approach, yes, and it pales when compared to the complexity and sophistication of technique in The Secret World, but there's much to be admired all the same. I do think we are, slowly, heading in the right direction. Tightening a few bolts here and there? Only to be expected shortly after launch. Revamp the entire dungeon experience? That's tantamount to admitting you got the whole thing wrong from the beginning. Dungeons haven't been good press for GW2, what with complaints that they're too hard, too chaotic, and play like WoW Dungeons after the Tank has died. Then there's the feeling they're a pain to get groups for, what with no Dungeon Finder and all, and there's no loot in them worth having anyway. Not to mention the very valid concern that groups for Story Dungeons will soon become impossible to find, if they aren't already. A revamp is unlikely to make things worse so this is probably good news but it's a shame they got it so badly wrong the first time round. I'd far rather they were adding completely new content than re-doing stuff on which the paint's barely had time to dry. 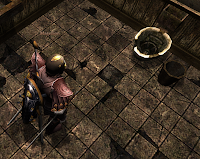 The new Fractal dungeons, on the other hand, seem to have gone down rather well. Yes, the mechanic does, arguably, flip the game on its head but the feedback I've seen on the actual fractal fun factor has been very positive. Hearsay only, since I've yet to try one, of course. More of a good thing is generally reckoned to be a good thing, unless it's too much of a good thing, which this almost certainly isn't. So, a Good Thing , then. Doesn't this fall under the heading of "general live game maintenance"? Hardly worth making a bullet point for, is it? I don't have a problem with the scaling system although I know some people do. It seems well-balanced to me. 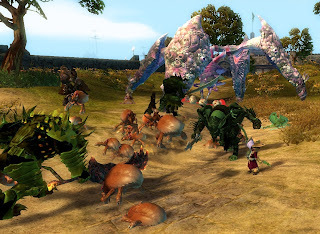 I also haven't noticed a particular lack of variety in creatures, or at least not any more so than in every MMO ever and I can't say I've felt short-changed on events either. As for "experiences", I have no idea what that means! Where are the donkey rides? Well it's hardly the "veritable tropical paradise of magnificent proportions" we were promised, is it? Although it was The Consortium doing the promising there and we know how reliable they turned out to be. All the same, Southsun hasn't drawn the crowds. When I've visited it's been somewhat dead. 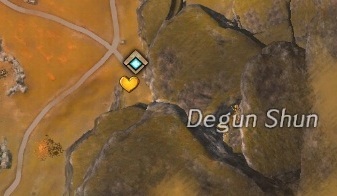 Not Orr-dead, thank heavens, but map chat sometimes offers the opinion that Southsun is too hard and there's no very obvious reason to be there rather than anywhere else. I kinda like it, meself. It does remind me of Ember Isle in Rift a bit, - some parachuted-in high-level content that feels a tad artificial and not entirely connected to the world, but I do like to kill me some Karka. I was expecting some more light-hearted content from the pre-release publicity, though. Perhaps that's what's in the pipeline. I'd rather they opened a new area on the mainland than expanded on this, really, but hey, I'll take new overland content where I can get it. Definitely needed, this one. I imagine by now most active guilds have gotten everything there is to get. There are only three of us in our guild and we almost have our 100 slot vault already, and apart from vault space there's actually nothing we want. Looking forward to seeing what they come up with here. Good luck with that. 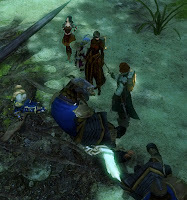 Of all the elements of GW2 sPvP seems to the one MMO bloggers know and care the least about, and I'm with the herd for once. ESport is beyond my remit. This can't come soon enough. 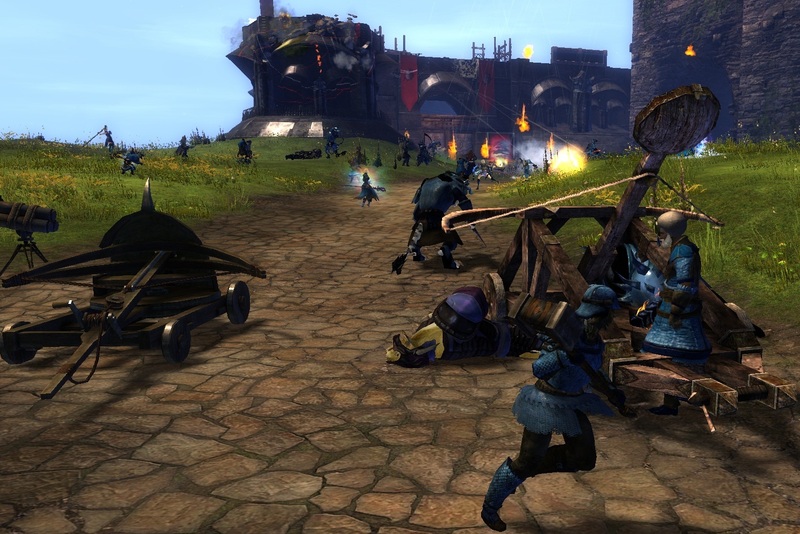 WvW is addictive, entertaining and accessible but it has some serious design flaws. The Ladder system is never going to work - a League, preferably split into two or three Divisions, would work much better. Some people think the zones are too small, many think it's a shame three of them are identical. Above all, with free server moves and no equivalent of DAOC's Guild and Character rankings, there is no permanence of any kind, either for the individual, the Guild or the Server. Must you? Couldn't you just work on the infrastructure part and leave the Story and Adventures to the players? Oh alright,if you really feel you have to, then perhaps you could headhunt a writer or two from The Secret World, or even EQ2, just to pump some life into the thing. More of the turgid same we really don't need. Overall, I think it's a bland and disappointing list. No expansion of the world, not a word on crafting, not the slightest hint on Housing of any kind. Looks as though it'll be down to the Holiday events to draw in the crowds because this kind of general par-for-the-course consolidation work isn't likely to light much of a fire under anyone. Fortunately I'm having a great time with the game as-is so my fire's lit already. 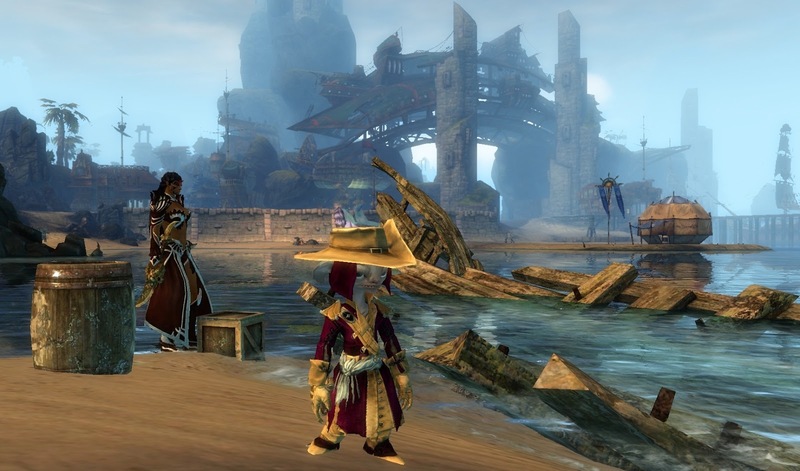 As expected, the weekend was all about GW2 and Lost Shores. I didn't even log in to Rift. 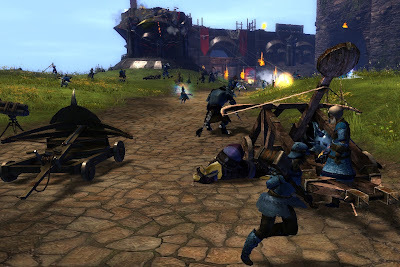 When we made the decision to buy Storm Legion a few weeks ago I was of the mind that I would be ready for a break from GW2 around about the time it launched but that would have been quite surprising had it been true. From the beta weekends I'd estimated my opening run in GW2 would probably be a good six months but by late October I was beginning to suspect that was optimistic and that GW2 might, at least on its opening salvo, be one of the dreaded "three-monthers". Not so. It transpires that wobble was just my undermind taking its bearings. 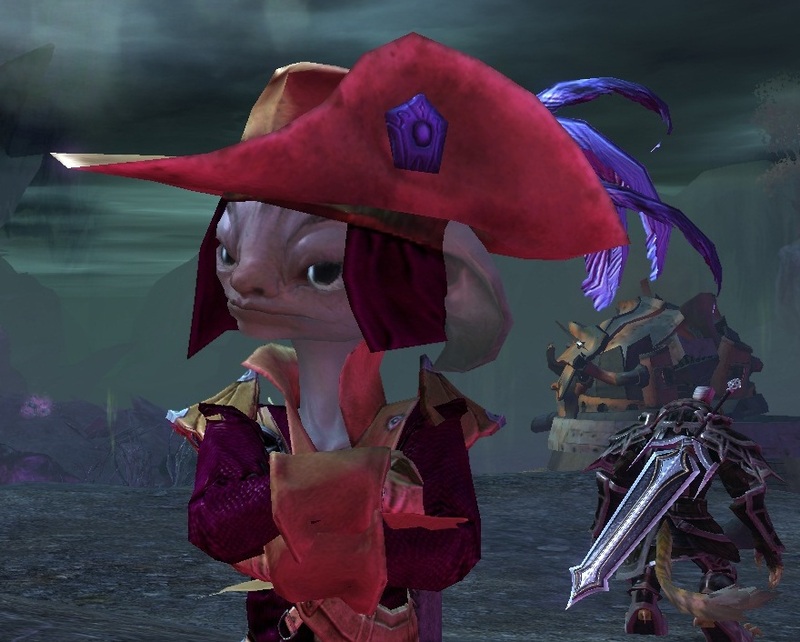 While there are many MMOs I could be playing right now, and want to play (EQ2, EQ, Vanguard, Rift, Pirate 101, TSW to name just the most obvious candidates), when I sit down in front of the PC it is always GW2 that the mouse pointer floats towards. I have a huge amount of things to do there, plans, goals if you will, but more importantly it's an incredibly pleasant imaginary place just to spend time in. It's comfortable, relaxing, inviting, welcoming and why would you want to leave? Well, you might have a beta key for City of Steam. All weekend the only nag in the back of my mind seeking to pull me away from Tyria was the knowledge that with a click I could be in Nexus again. 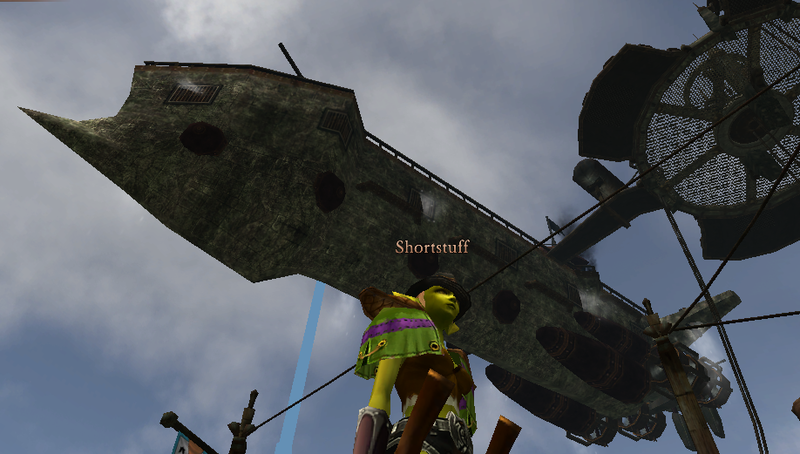 Once the Karka threat ended I gave in to the tug and what a joyful experience it was. Yes, it's even better than before and it was already wonderful. Back in March when I took the Sneak Peak I said that I'd play the game as it stood and I would have, too. Then came the Alpha, bringing many improvements including housing. I'd have played that as a finished game, too. How little I knew. Now here we are in Closed Beta (for a given value of "Closed") and much has changed again, all for the better. City of Steam is shaping up to be really something quite extraordinary. I rolled a Goblin. Wait, that sounds weird. 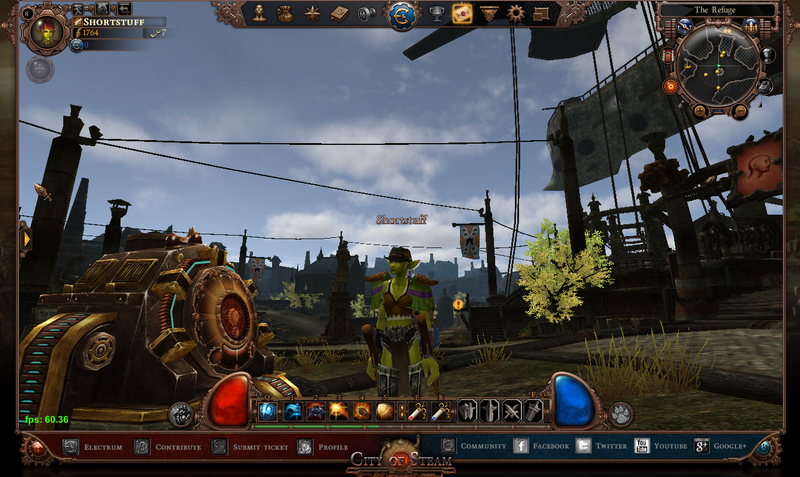 I chose "Goblin" as the race for my character. That's better. The options at character creation now include a range of excellent headgear that I only wish The Secret World could match. Further customization options are in the stretch goals for Open Beta but the characters are pretty expressive already. Entering the world, the action now begins with your home city on fire and a pell-mell rush to the Railhauler to save your family. It's a much stronger opening and puts the refugee status that all player-characters begin with into a better-defined emotional and narrative perspective. The journey on the Railhauler itself has been pared and polished, all the fat stripped off to leave a clean, invigorating introduction to basic gameplay and UI conventions. The Railhauler now sets you down at the terminal in Nexus, which I found peculiarly affecting and satisfying. This is a transport hub I'd seen often from the outside, as it were, and to arrive at it as a traveler was quite an intense experience. Not going to have that resonance for anyone who hasn't been through all the previous iterations of course, but its a great introduction anyway. Graphically, Nexus just looks stunning, as do all outdoor areas, of which there are plenty. There's no "looks good for a browser game" about it. City of Steam looks good, period. The one absolutely infuriating thing is Mechanist Games' complete disinterest in supplying an in-game screenshot feature, leave alone video. The game looks just quite astonishing when run at the maximum graphic settings in Full Screen, which is how I play it and in which it runs flawlessly. I can't demonstrate this, however, because the only way you can even work around the lack of recording options in-game is to cut&paste from Print Screen and using that in Full Screen mode just gets you a matte black rectangle. I spent an hour or so researching and downloading external screen grabbers, including some that are alleged to work with CoS but without success. Consequently, all the illustrations here are from the much smaller windowed version of the game and look about 20% as impressive as they should. That single complaint aside, so much has been added or smartened up since Alpha. The wonderful ambient soundscape is back and better than ever. All the quest dialog has been re-written. The familiar matter-of-fact placeholder text has been replaced with some very good, witty, banter in sharp, idiomatic English. The sequences and steps of the starter quests have been tidied into much smoother order and the whole "Welcome to Nexus" sequence is a real pleasure to play through. Slots on either side of the main hotbar now confirm we get both Mounts and Pets. There's no Jump function but when I hit the spacebar this time round, forgetting that, I got a red message "Jetpack not equipped". Crikey! Apparently this isn't a joke and jetpacks really are in the works. Mounts and pets are already in. I saw a number of motorcycles, entirely in context in this industrial setting, and a very large frog, possibly less so. Some of the bikes were hovering a dozen feet in the air but I'm pretty sure that was a beta bug not a feature. There are a few hours of this first beta weekend left and I'm off to make the most of them. Not to repeat previous mistakes but I really would play this now. Permanent characters can't come soon enough. It ended with a bang. After two hours of non-stop mayhem, the Ancient Karka slipped under the hitherto unseen lava, lurched back up like any good horror film baddie, then slumped over the lip of the pool, dead. And a massive chest appeared. I wasn't expecting loot. During the two-hour event many people made jokes about what reward we might get for our many, many deaths. Diddly squat was the consensus, if we were lucky. In the end I got a couple of rares and a couple of exotics, one of which I could actually use, and everyone got a 20-slot bag (worth about $10 in real money) and a level 80 exotic jewellery item. Some folks even got Legendary Pre-Cursors and if you don't know what those are then bully for you. But it's not about the loot, is it? No it isn't! That wasn't a rhetorical question! It's about the fun and the camaraderie and the being there. And weirdly, this time I can say that without irony. 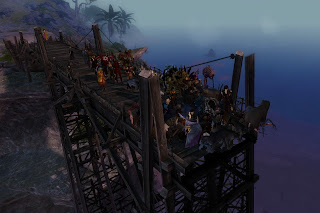 I did the entirety of Lost Shores Phase 3 on an Overflow server, where people come together who may never meet again and yet the whole two hours passed in excellent spirits. Despite many setbacks there was a steady stream of hearty, good-natured, articulate banter. Much as happens on the Frontiers of WvW, leaders arose spontaneously to direct the efforts of the zerg and were heeded and after a great deal of struggle, at several points during which I found myself wondering if ArenaNet had thought of providing a Failure condition, we eventually prevailed. Is this the line for JBoots? All's well that ends well, then. 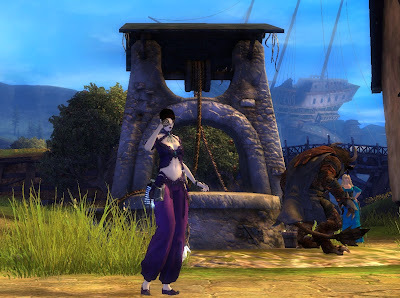 Unless you were one of the unfortunates who disconnected before the chest dropped and couldn't get back in (the log-in servers seem to have died - I'm writing this now because when I took the ship back to Lion's Arch the game crashed and that appears to be my lot for the evening). Or who wasn't able to play at all for whatever real-life reason. Or who had so much lag it was impossible to do anything meaningful and gave up. Clearly these events are problematic. The forums are mildly busy with discontent. It needs to be recognized that not everyone enjoyed themselves. I had a great time, though and map chat for the two hours the event took suggested a lot of other people did too. On balance I thought Lost Shores got better stage by stage. Phase One was really very buggy indeed. It's probably fair to say that as far as the "quests" went more didn't work than did. There were patches and deadline extensions and a lot of scrabbling to try and get the loose ends tied. The invasion of Lion's Arch was fun but laggy. I expected the Karka to win and take over the city for a day or two so I also found it somewhat anti-climactic when we ousted them quite easily. Phase two was late starting, much shorter, a lot less laggy, largely bug-free and over in about three-quarters of an hour. The introductory re-invasion didn't even happen on the Overflow server I was on. The ship just appeared and off we went. The core of the event was a chain similar to those we've seen many times before. Good fun but nothing amazing. Phase Three was the "multi-hour" climax. It qualified, on the smallest possible value of "multi", finishing in about 130 minutes. 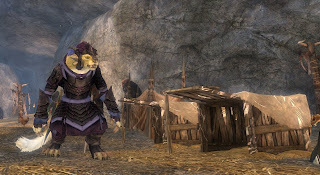 I almost missed the beginning, having to run one and a half times around the entire island before I found the Lionguard Detonation Team but from then on it was action all the way as we went up and down the spiral ramps of the Karka hive laying bombs and harried the Ancient Karka hither and yon across the salt flats. I think we were all expecting the finale to be the exploding of the charges we'd set and the collapse of the mountain, which would have been truly spectacular. In the end I didn't notice the detonation at all, if it even happened, and the event ended with the Ancient Karka trapped at the bottom of the Hive succumbing to our withering fire. Was it a success? Well, I enjoyed it. I'd do it again, or another like it. For me, the fact that it was a one-time event made it worthwhile. It felt like an event in the non-gaming sense of the word. I was glad to have been there and done that. If it was going to happen every three hours for the next few days then I might well not have bothered with it. Oh alright, I probably would. But I'd have been sighing the while. Will ArenaNet stick to their guns and carry on pumping out content that vanishes into the aether of memory after a single outing? I hope so. They seem surprisingly prone to vacillation right now, so I'm less confident of their stubbornness than I was, but yes, I do hope they keep it up. It may be wasteful and controversial and it may provoke discontent but I know that if I'm playing another game and they announce something like this again, I'll be back. The first City of Steam Beta weekend started yesterday. I did finally get my key in the mail so I won't be needing one of Vagabond's after all. If anyone else wants to take a look at help test this very fine upcoming kind-of MMO, as I write this ONRPG still have over 1700 to give away. No doubt there are plenty more sprinkled around the internets. Long weekends, too as you can see. Well worth a look if you haven't tried it already. [Edit] Sod it! Just logged in to character select to take the screenshot above - the new introduction and that wonderful music is more than I can resist - there go my plans for the weekend! To begin with a digression, I was about to rummage in the cliche bag and come up with "much-heralded" as an opening to this brief run through the first phase of Guild Wars 2's "Lost Shores" event when it occurred to me what an inappropriate phrase that would have been. Much hyped, certainly, but heralded? I haven't heard a peep from my own personal Herald for weeks. Perhaps my singular lack of enthusiasm for any of his previous proposals has led him to seek employment elsewhere. Or maybe it's just because I never paid him. There's something in the waterrrrrrrr! His absence hasn't quietened the flapping of my letterbox, though. Far from it, and that's my main complaint about Lost Shores so far. But we're getting ahead of ourselves again. Let's recap. 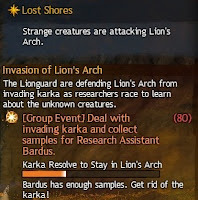 At exactly 8pm last night a very brief cut-scene signaled the Karka invasion of Lion's Arch. Given the completely unexpected, surprise nature of this attack it was incredibly fortunate that several hundred heavily-armed adventures just happened to be holding an impromptu fireworks party around the Lion Statue plinth, where rebuilding work has just begun. There ensued half an hour or so of the kind of chaos and mayhem that I thoroughly enjoy, although other opinions are available and were indeed volubly expressed in map chat at the time by some who might have been better-employed crabbing than carping, given that the invaders turned out to be crabs. 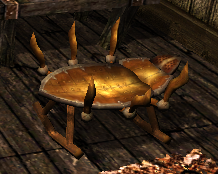 Big crabs, I'll grant you, with very tough shells, but crabs all the same. As huge MMO events go, it was nowhere as laggy as many I've attended. I was able to move, fight, communicate, loot and follow instructions reasonably well. It fell squarely within my tolerances for playability, although those are admittedly broad. 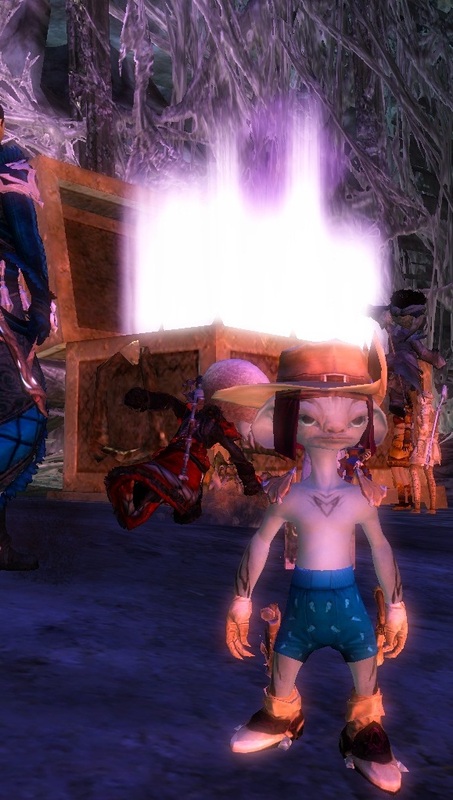 I didn't get any Karka Samples until the Asura collecting them announced he had sufficient - in fact I was barrelling towards him with the two I'd managed to hack off some baby crabling a minute before when he decided to shut up shop. After that, of course, I got dozens. Eventually the concerted forces of the Lionguard and sundry adventurers drove the Karkan horde back into the sea and the inquiry began. After a brief examination and dismissal of the new hand-ins at the Mystic Forge, which Mrs Bhagpuss rightly identified immediately as not much more than a new item-sink, we moved to the beach where the wreckage from the boat that sank in the opening cut-scene had washed up. Confusion ensued over crowbars. The ones lying on the beach appeared not to work. The server briefly hiccuped a roll-back after which I found myself next to large chest filled with the things and I had soon had the top off a barrel. Incriminating evidence led me to the incredibly annoying Blingg. If I never hear the word "CITIZENS!" again it will be too soon, that's all I'm saying. 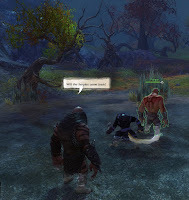 He soon cracked under our skilled interrogation and it was off on a merry chase around Caledon Forest and Kessex Hills. 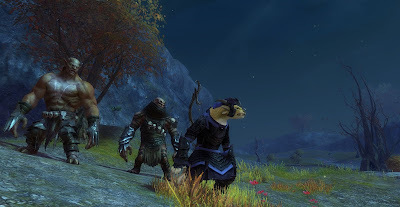 Karka were fought and defeated, clues were discovered and deciphered and around midnight after a fruitless search for Lionguard Tyrro we called it a night. Come on! He can be hurt! I just did 12 points of damage! As events go I enjoyed it. 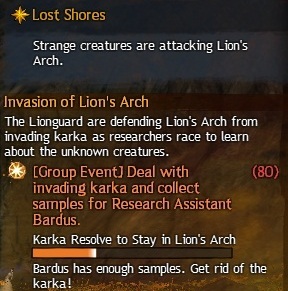 I didn't die once, I was largely able both to follow what was going on and to participate effectively and the Karka turned out to be surprisingly convincing invaders. There were bugs and glitches but I've seen much, much worse. So far I'd give it about seven out of ten. The one thing I really didn't like derives, I think, from ArenaNet's stubborn insistence on reinventing a wheel that wasn't broken. What follows the invasion is by any rational analysis a questline. 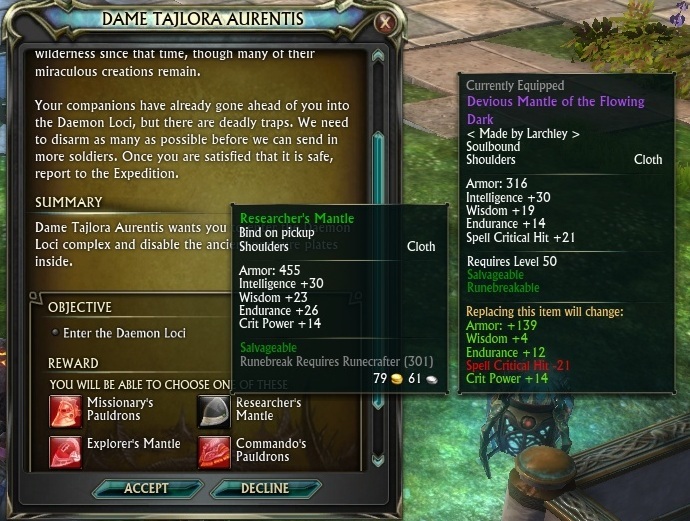 Only GW2, of course, doesn't do quests. 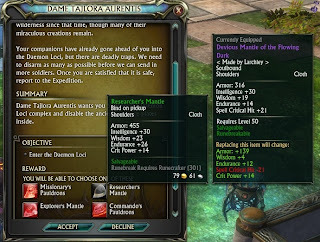 Consequently, where other MMOs would have a nice, neat journal entry with stages that tick off tidily when completed, what we got was a series of bizarre notes in the mail and a lot of vague hints in the Event descriptions. It's a half-assed, clumsy way to deliver content of this type. It works, but in the way that tying a piece of string between two baked-bean cans worked to talk to the kid next door fifty years ago. We have mobile phones now, maybe you noticed? That cavil aside, I thought it all went off nicely. I certainly had a lot more fun doing just that first part than anything that was thrown at us for Halloween. Looking forward to phase two tonight. Oh what a kerfuffle. Our lovely flat-leveling-curve-no-trinity-whole game-is-end game-mold-breaking MMO turned out to be just another vertical progression gear-grinder after all. Maybe. There's a thread the size of Jupiter about it over at the official forums and the MMO blogosphere spontaneously combusted. 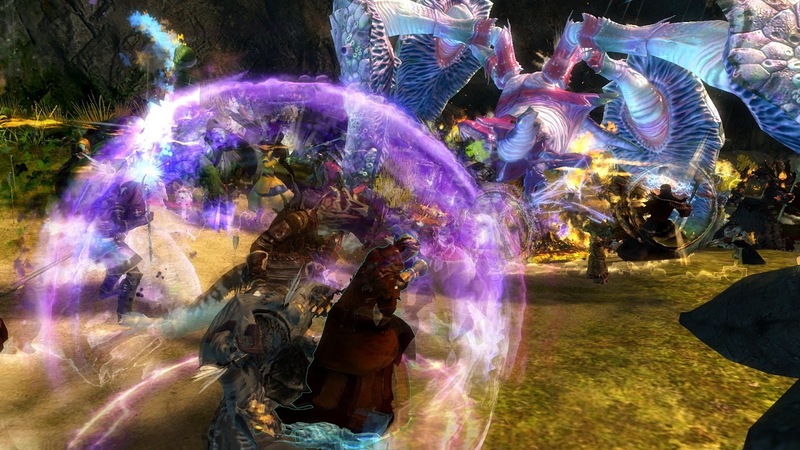 Over at ArenaNet damage limitation protocols have been activated with limited success. KTR has the skinny and more revelatory links. In other news, as Potshot observes in a welcome return, Rift has a pending gearpocalypse of its own, something I noticed on accepting my very first quest in the New Continent. 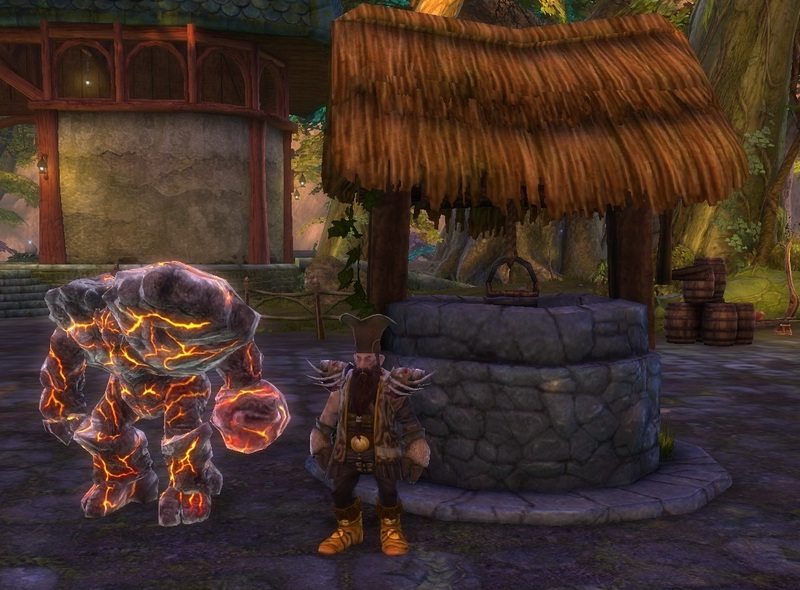 Rift players are getting what they expected and almost certainly wanted. GW2 players...aren't. There's absolutely nothing whatsoever wrong with making a solid, end-game focused, dungeon-oriented gear-grind vertical progression theme park MMO. Make a good one and that's fine. Just don't say you're making something totally different then morph into one five minutes after launch. Of course it makes only the most notional difference to me since I rarely get to end-games in the first place and have no intention of even setting foot in the dungeons in question, far less grinding in them for gear to let me grind in them more. If this wasn't just a video game I might say it's the principle of the thing but it is so I won't because that would be fatuous. We really shouldn't be surprised when this stuff happens. But then if we weren't, we'd all be SynCaine. Then where would we be? 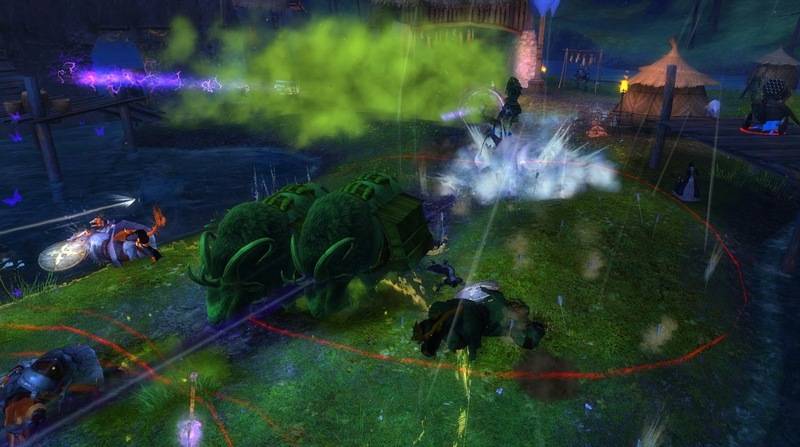 It's Dungeon Month in Guild Wars 2. Along with perennial "favorite" 50 WvW kills and three rows of question marks, sure to relate to That Which Must Not Be Missed , new to the Monthly Achievement shopping list for November comes "Dungeon Participation", which has us running five dungeons. Or not, in my case. I can't be bothered, frankly. Not that not being bothered bothers me. One less thing to do this month? Great! 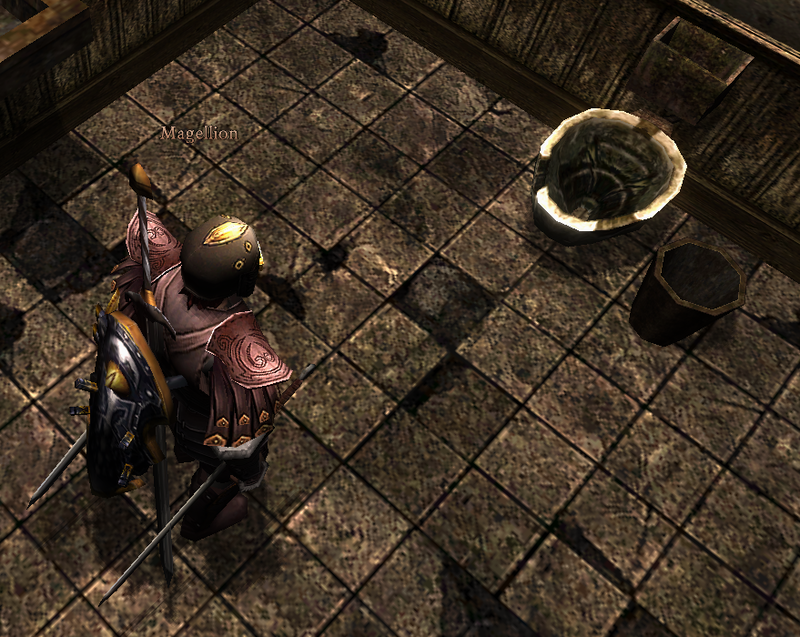 What does bother me a bit is the general state of MMO dungeons these days. Somewhere around the dawn of MMOs, or 1999 as we counted time back then, I played a game called Everquest. 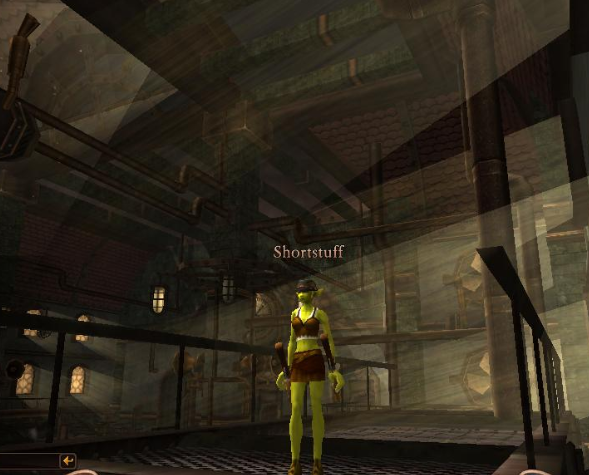 My understanding of what a "dungeon" is in a shared virtual world derives mostly from those formative years in Norrath. A fish in a dress. Whatever next? Within a few weeks of stepping out into Qeynos Hills I understood that the above-ground world was for everyone but the depths were for the brave or the foolhardy alone. 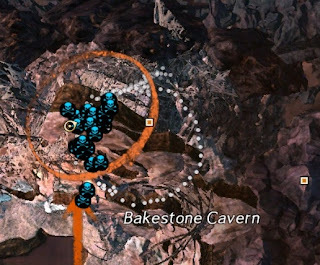 Soloists, kiters, xp groups, most players clawing their painful way up the scree to Level 50 stayed outdoors, where they were looked on with amused contempt by the Dungeon Players passing by on their way to Lower Guk or Sol B. At lower levels everyone gave it a go, of course. I spent some of the best sessions of my entire MMO life down the gnoll-hole in Blackburrow. Come Sol A or Castle Mistmoore, though and I was making my excuses. Dungeons were hard. Dungeons were dangerous. Dungeons were damn scary. First you had to find people to go with, then you had to get there. That could take most of a session in itself, especially if several people died on the way, as they often did. Then you had to force your way in past the indignant residents, often "breaking" a room at a time by a process of careful pulling. Get more than you bargained for and you'd be back at your bind spot (which for a melee character might be on another continent). Remember how much trouble you just had? Now you get to do it all over again, only naked. Good luck with that!. Makes you wonder why anyone went in the first place. Well, duh! Treasure! Dungeons were where all the best loot was. And the best xp, provided you didn't lose it all with multiple deaths. Of course, to get that treasure you didn't just have to kill the monsters who had it. You had to get to it before anyone else. You didn't get a nice, cosy instance all to yourself, where you and your best buds could take your sweet time making plans and divvying up the loot. That came later. Beneath the sands of Ro lies...more sand. The first instances I saw were in EQ's sixth expansion Lost Dungeons of Norrath, which arrived in September 2003 bringing with it six months of the best MMO gameplay I ever had. Suddenly dungeons were for everyone. The entrances were (relatively) easy to get to, there was a huge critical mass of players just itching to help you explore them and best of all the mobs didn't respawn. No respawning mobs meant no breaking and holding rooms. No longer did we need to fight to a spot where a known named spawned and camp him for three hours hoping he'd bring his "good drop". Now we were dungeon crawling! Scout the corridors, clear out the nests of evil and move on. In essence this brought the whole thing back to where it presumably began. The non-respawning, group dungeon crawl is the staple of tabletop fantasy gaming from a decade or two earlier. For a while it was good. I learned more about dungeon tactics and etiquette in six months than I'd learned in the previous four years and so did most of the EQ population. You could see people becoming better players week by week. I also got a real taste for dungeoneering that I still savor today. All too soon, sadly, as tends to happen to any successful innovation the whole experience began to be codified. One set of undesirable behaviors (camps, trains, corpse runs) was replaced by another (gear scores, speed runs, dungeon grinds). Pick-up groups, which had been the equivalent of joining a scratch game of soccer in the park, gained a reputation more akin to being locked in a holding cell full of drunks and muggers. Even at their best, dungeons became something to learn and perfect, not to explore in fear and wonder. There never really was a Golden Age, of course. Lower Guk was once so camped that I strolled down there at level six and filled my bags with valuable Fine Steel weapons that people couldn't even be bothered to loot. 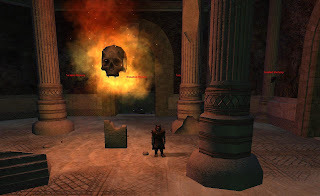 In a popular MMO the biggest challenge in an open dungeon was probably finding a spot that wasn't camped and in an unpopular one you were lucky to find anyone at all to help you even get past the guards at the entrance. We must be right at the end of that cycle by now. Past the end. There must be another way to do Dungeons that isn't either of the above. A way that will seem new and fresh at least for a while, until, inevitably, relentless iteration polishes it to a soulless sheen. Or perhaps not. Perhaps there are no better ways to go down a hole in the ground and come up loaded with gold. One thing's for sure, though: it'll take more than hanging a few jugs of Karma on the end of a stick to lure me back into that once-welcome darkness. Look, I don't want to complain and I know I'm always going on about this but hasn't it been an insane year for MMOs? 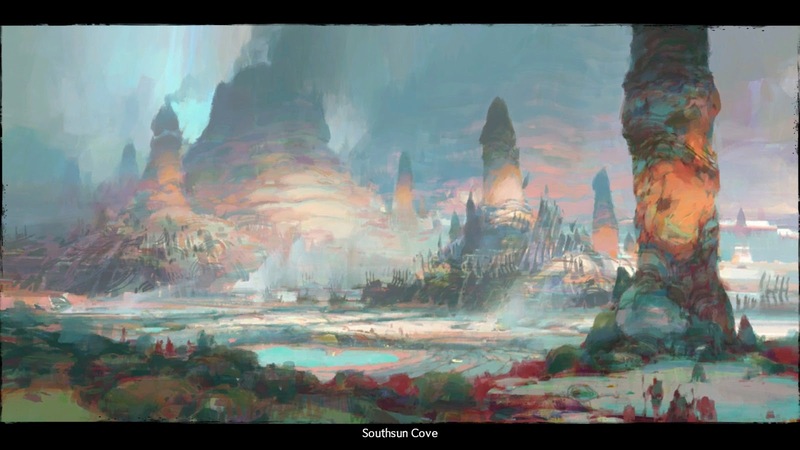 From the Guild Wars 2 beta weekend ramp-up in the spring through The Secret World's early summer launch, bleeding into the GW2 headstart there's barely been a moment to breathe. It's not getting any easier, either. Everything is beginning to pile up. Tuesday sees not only the start of Rift's Storm Legion expansion but also EQ2's Chains of Eternity. Just three days later we get GW2's Lost Shores event and the first City of Steam beta weekend. That's some week! Ideally I'd like to give full attention to everything on that list. 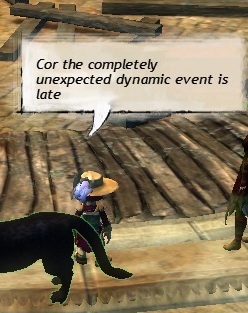 A major one-time event in an MMO I'm playing every day? Why would I miss that? The first five-day beta window for a new game I've been following and raving about since pre-alpha? That's has to be a priority. Expansions for MMOs I've played from launch and in which I have much-loved characters I'm still very keen on developing? That's got to be at least two or three months solid gaming right there. No, you cannot have a "steam bath"! It's all very well mithering on about whether one-time "dynamic" content is a good thing or not but as first-world problems go that one pales into insignificance compared to how all this potentially great entertainment can be fitted in to the hours left after work and sleep take their essential bites out of each day. I'm well aware that there are a lot of jaded MMO bloggers out there, filled with ennui and disenchantment, struggling to find the motivation to log into anything at all, reverting back to older patterns of minorly-multiple, offline or even tabletop gaming, or in the most extreme cases no gaming at all. I'm not one of them. I have a very different problem. There's too much good stuff! It means I have to make choices and I really hate that. I hardly dare raise my head and look any further than next week - if it's like this now, what's it going to be like when WildStar, Neverwinter and the slew of other championship contenders slip the stalls? I have to have a plan. I'm not going to go as far as Syp and make an actual schedule but I am going to have to come to terms with a new reality: there is just more MMO fun worth spending time on than there is time available to spend. If I had nothing else to do but play MMOs I still wouldn't make much of a dent. This week's plan involves shelving the EQ2 expansion. This morning I read Niami Denmother's excellent overview of the new crafting content. In normal circumstances that would be enough on its own to nail down my pre-order even without the reportedly fine adventure content, new levels and all, but these aren't normal circumstances. Those Chains of Eternity are going to have to dangle for a while. Mechanist Games are doing their best to make life a little easier by not sending me a beta key for City of Steam. They seem to making quite a song and dance about beta access, with a whole raft of competitions related to Likes on FaceBook and followers on Twitter and giveaways on podcasts and websites. I have neither the time nor the patience for any of that nonsense. If I really wanted into the beta I could buy one of their unfortunately named Collaborator Packs (really guys, did no-one spot the connotations there?). I don't have any objections in principle for paying for beta access but in this case having to do so provides a handy get-out clause. I've seen as much of City of Steam as I need to already. I know it's a fantastic quasi-MMO that I'll be playing a lot. I'm happy to wait for launch. 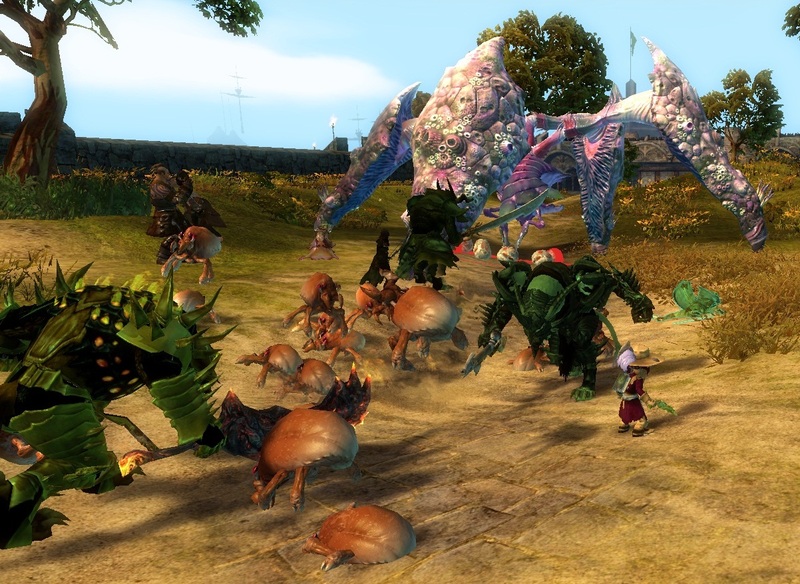 That leaves Rift and GW2 as the main courses in this week's banquet. I guess the "plan" boils down to Rift for the week and GW2 for the weekend. That'll be the weekend when I get my long-awaited 7" Tablet PC. I wonder what MMOs run on that?